A man has been arrested on suspicion of drink driving following a crash on the A27 at Lancing last night. Emergency services were called to a three-car collision westbound on the A27 Old Shoreham Road at Lancing at 6.30pm on Tuesday, February 14. 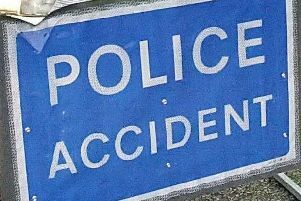 According to police a Honda Civic had been in collision with a Peugeot 207 and a Ford Fiesta queuing in stationary traffic. The driver of the Honda was arrested on suspicion of drink-driving, police said. The driver of the Peugeot, a 36-year-old Worthing woman and the driver of the Ford Fiesta, a 36-year-old Shoreham man, both suffered whiplash and were taken to the Royal Sussex County Hospital, Brighton, a police spokesperson added. One lane of the A27 was closed to recover the vehicles and re-opened at 8.30pm. According to police, Adrian Hemsley, 37, of Burlington Gardens, Portslade, was arrested and charged with driving with excess alcohol. He was bailed to appear at Worthing Magistrates’ Court on March 7. Police had initially said the crash involved four cars but today a spokesperson said it had been three.